My Healthy Blueprint Powered by Baptist Health Care is a wellness program that uses data, health-risk assessments, education and coaching to customize a health care model for individual health success. The goal is to motivate behavioral improvements that result in good health. 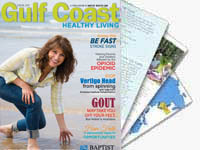 The program launched in 2010 as an extension of Baptist Health Care, and since then, we’ve provided support and positive results for thousands of Gulf Coast residents. Our program is tailored for business. Read through our website and email us at Blueprint@bhcpns.org or call us at 1.855.469.6903. We’d love to meet with you and set you on your way to a healthier life.